"The phenomenal artwork is what truly makes this book special. The landscapes of the sea, the sky, and outer space are breathtaking. Cort s's different blending and thinning of the colors create a world of beauty. This fascinating tale of perspective and point of view makes a fine addition for most collections." "Sumptuous paintings and an engaging conceit make this a terrific read-aloud choice." "A stunningly illustrated story of a shark who has a frightening encounter with 'sea creatures' who come from above." "Cort s' premise has child appeal and even some STEM utility, and his lovely illustrations invite contemplation of the teeming worlds above and beneath the sea...The depictions of the curve of the Earth in space and of the sky--cloudy or starry, always vast--are lush...Enjoy this tale's accomplished visuals and percussive rhymes." 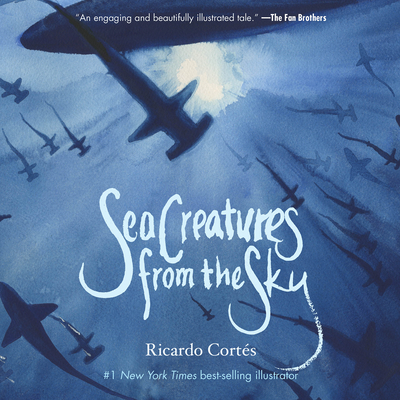 " A] memorable and beautifully illustrated children's picture book...Ricardo Cort s's stunning seascapes follow the adventures of a shark that has a story to share about creatures who live above the ocean...Filled with humor and warmth, Sea Creatures from the Sky will charm and entertain children." "One can applaud Cort's for inviting us to learn about sharks...children will enter and emerge from this book with a new understanding of humans' interest in sharks and ocean life." "Stunning illustrations immerse us into understanding the shark's perspective. A valuable concept that can change how we think of any fellow earth dwelling creature be it on earth or in the sea." "The story moves in a poetic ebb and flow of an ocean current, and is well balanced by the very colorful illustrations." "A beautifully rhymed and painted book that is almost philosophically asking about the being and existence of otherness. Proved and tested with my two-year-old, who became very tranquil and curious looking at the beautiful seascape." "This is a gorgeously illustrated view of the world by a shark." "A beautifully illustrated book that is a magical and compelling read "
"Enchanting. You feel like you're in the water swimming with the other fish...The images alone are worth the price of the book." A shark, swimming the seas, encounters...Aliens. Sea Creatures from the Sky is a gorgeously illustrated children's picture book from the New York Times best-selling illustrator of Seriously, Just Go to Sleep. Cort s's stunning seascapes follow the adventures of a shark that has a story to share about creatures who live above the ocean. Our shark encounters strange-looking creatures who resemble nice, caring marine biologists. But after they release it back into the ocean, the shark cannot find one friend to believe its tale. Filled with humor and warmth, Sea Creatures from the Sky will charm children and parents alike.